SNAP/EBT and Fresh Bucks Coming to Namaste Farm Stand! We are thrilled to announce that Namaste Farm Stand has been authorized to accept EBT benefits and Fresh Bucks coupons! People have been asking to use EBT benefits at the farm stand since our grand opening. 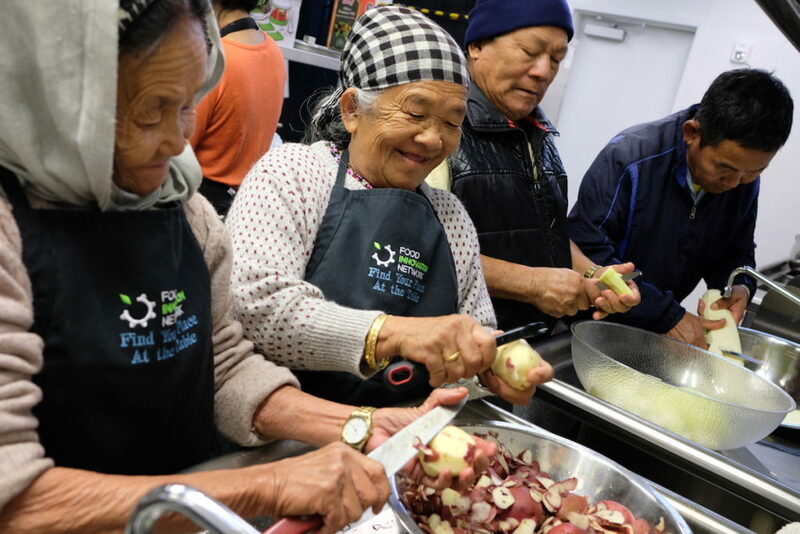 We knew it was a need; our community survey results showed people would use their EBT benefits at the farm stands, and SeaTac and Tukwila has some of the highest SNAP participation rates in King County. 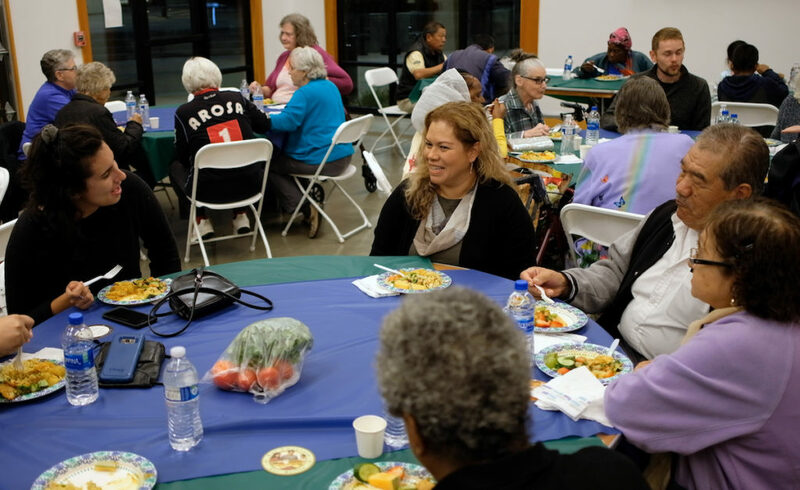 Tukwila has the highest rate among seniors 65 and older – 30 percent use SNAP benefits compared to the countywide average of 12 percent. Starting at our Tukwila location on Aug. 15, and in SeaTac later this month (stay tuned for the exact date), community members will be able to purchase fresh fruits, vegetables and herbs from the weekly farm stand using their EBT dollars (also known as SNAP, Basic Food or Food Stamps). In addition, EBT cardholders can get a dollar-for-dollar match through the Fresh Bucks program. We began the application process last fall, but had a challenging time moving forward largely due our unique model. We’re not a farmers market. We’re not the farmers. We’re a mobile farm stand operated by a nonprofit that buys wholesale from local growers to then sell directly to the community. This all made it challenging to check of the necessary boxes in the application and submit. However, thanks to the dedication of many partners, we were able to get clear guidance from USDA’s Food Nutrition Services (FNS), the federal agency that manages EBT retailer authorization. We would like to extend a BIG thank you to partners that helped us through the application process. FIN and IRC’s New Roots Program received support from King County Public Health, WSU SNAP-Ed and WA Farmers Market Association. Customers purchasing fruits and vegetables with their EBT card get matching Fresh Bucks equal in value to the fresh produce purchased ($2-for-$2 in Fresh Bucks). For example, the customer purchases $6 of fresh fruits and vegetables using their EBT card. They then get $6 in Fresh Bucks to spend on produce in another transaction. The Fresh Bucks do not need to be used at that time—they expire at the end of year and can be used at any participating location. Post and share this flier around the community. Distribute these fliers to community members, clients, or program participants. Create your own Facebook video in other languages. Don’t forget to tag Food Innovation Network. Request a presentation by FIN staff or Community Food Advocate to come talk to about this and other food resources in the community. We can come to classes, workshops and community meetings and present in many different languages. If interested, please email Kamal Adhikari at kamal@foodinnovationnetwork.org. Visit Namaste Farm Stand and get some fresh, local fruits and veggies! Namaste Farm Stand sells fruits and vegetables from local producers including IRC New Roots’s Community Garden (Tukwila), Faith Beyond Farms (Enumclaw), and Collins Family Orchard (Selah). 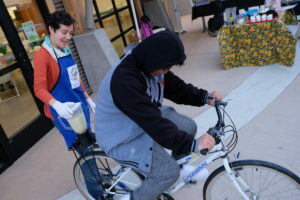 Each week we’ll do a cooking demo showing ways to prepare and cook the variety of produce for sale. We are fortunate to have great partners and funders in making this project happen. FIN and IRC New Roots would like to thank: City of Tukwila, Kona Kai, Communities of Opportunity, Les Dames d’ Escoffier, Matt Griffin YMCA, SHAG, and WSU Extension. 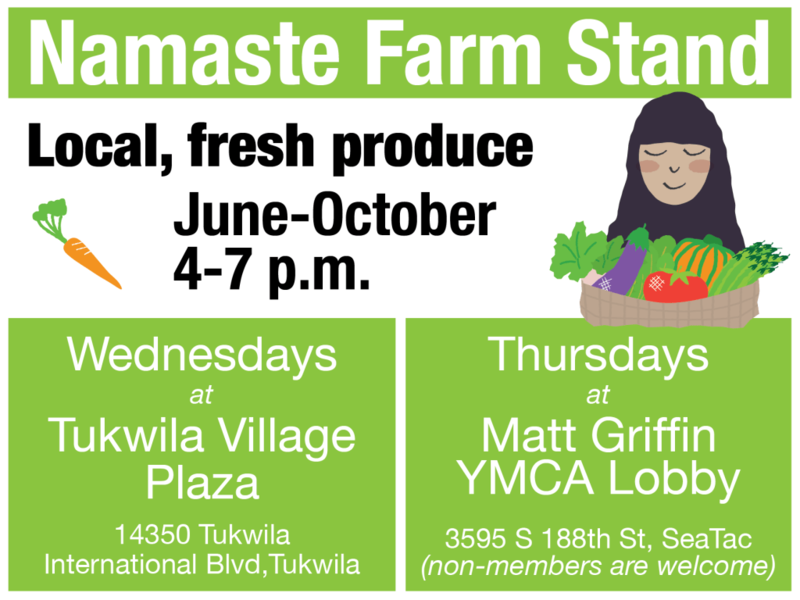 Namaste Farm Stand to Open in SeaTac and Tukwila!